See what a selection of our customers have to say about our Knitwear Re-Dress & Repair Service. We love hearing from our customers - if you’d like your testimonial to appear here, just contact us!
" Thank you so much for your personal service. A great job - I'm so pleased. My Mother's cardigan has a renewed life. I shall not hesitate to recommend your services! " " Thank you very much for the lovely job done on my two cardigans. I will love wearing them again - they look perfect! " " Absolutely over the moon with your service. Thank you so much! " "I've just received my lovely red cardigan and wanted you to know I am absolutely delighted with the result - thank you. I will have no hesitation in recommending your service!" "My cardigan arrived today, I must say you have done a splendid job, I am absolutely delighted! I shall pass on your details to friends if they need your services.
" We have just unpacked my wife's cardigan that you repaired. We are absolutely delighted with the result, in my opinion a perfect job. Your excellent service has given a 23 year old cardigan a totally new lease of life and looks like new again! Very impressed with your company and will certainly use you again and recommend you to our friends. P. S. The way the garment was packaged and presented was also extremely impressive. " " I would just like to say how delighted I am with the repair that you did recently on my husband's cashmere jersey. I am very impressed by the service you provide and the care clearly taken by all concerned. I won't hesitate to recommend you to my friends and family! Thank you "
" Just picked up my jumper what an amazing job thank you so much "
" I wanted to let you know how delighted I am with the repairs you have made to my jumper. You have given it an entire new lease of life and I am thrilled! Also, it arrived beautifully packaged and boxed up and, instead of looking like a tired holey old thing, it has suddenly got a whole new lease of life as a luxury item. All best wishes, thanks for a great service. " " My sweater has just returned to me and I can't believe how beautifully it has been repaired. Also very quick - I thought it would take much longer. Brilliant. " " I received my jumper back today and I am so impressed with it. When I found all the holes I was going to throw it away but the found you on the Internet. You have done a fantastic job.
" I have rec'd my sweaters back today. Well what can I say. The navy blue one was been restored and it's wonderful. I have more to send :) "
" Just a brief note to say how pleased I am with the recent repair to my cashmere jumper. I had thought it was beyond repair as the fabric had worn very thin and with a 1cm hole. The results of your work are outstanding, the repair being completely invisible! And the jumper was returned beautifully packaged in 'as new' condition. " " I am so absolutely delighted with the repairs you have done for me. I've had some of my favourite cashmere sweaters sitting around, unworn, because of the holes. Then I saw your services advertised, and immediately sent four sweaters off to you. They came back perfect! You can literally hardly see where the holes were, and some of them were quite big. And all so beautifully packaged - it was, I have to say, a total surprise and delight. Which is why I want to pass on my thanks and congratulations, and let other people know that all is not lost when moths eat your favourite cashmere sweaters! " " This is the second time I've asked Love Cashmere to repair extremely difficult holes and each time the work has been carried out with such skill that it is impossible to see a trace of the repair. The price for the repairs was a fraction of that quoted by British Invisible Menders and completed within several days, rather that the two months quoted by BIM. My cashmere was returned to me on time and carefully packed. I can, without any hesitation recommend this excellent family run company. " 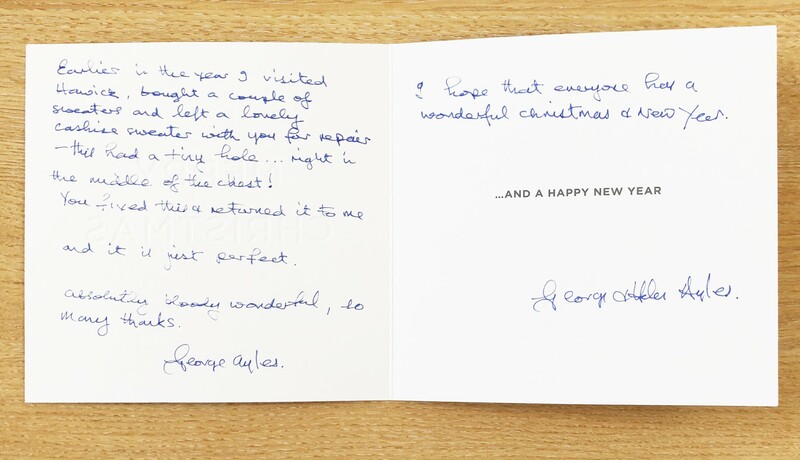 " I have never seen such an excellent repair apart from one you did on a Loro Piana jersey. I am very grateful. My wife and I strained our eyes trying to find the repairs. Well done. A brilliant service. " " I am writing to say that I received my jumper back from you over the weekend and am absolutely amazed at the repair to the extent that I am struggling to find where the original damage was. I am as you will note really delighted with your repair and I can only say thank you very very much. " " Thank you SO much for the amazing job you have done on my favourite cashmere jumpers! I can't thank you enough they look amazing and I am delighted! Can't wait to recommend your services to everyone! " "I have just received my much loved dress back from you and am writing to say how delighted I am with it. The repair is great even when you know where to look and it has arrived looking brand new. Thank you so much for such a wonderful service, I will not hesitate to recommend you to anyone in need." "I have just received my jumper from you and I am absolutely delighted with your repair and rejuvenation! A miracle! This is the second jumper you have done for me and I am full of admiration for your service. A fair price for such skilled work." " I have just received my much loved dress back from you and am writing to say how delighted I am with it. The repair is invisible even when you know where to look and it has arrived looking brand new. Thank you so much for such a wonderful service, I will not hesitate to recommend you to anyone in need. " " Someone had rung me to warn me that it might not be possible to make an invisible repair, but I honestly cannot see where the holes were, and the cardigan looks like a new one! The service I've had is second to none, and reminds me of how things used to be fifty years ago! Someone even emailed me to let me know that the cardigan had been received by your workshop, which is very unusual in this day and age! Many, Many thanks for a job really well done, and I intend to tell all my friends about your wonderful firm! " " Just wanted to say WOW - thank you so much! I cannot believe you have made my two sweaters looks so beautiful and brand new again. What an amazing and beautiful service you do – I will certainly be recommending you to friends this really is superb. " " I'm delighted with the repair. It's not often things come back better than expected! " " Thanks so much! I thought this cardigan was a goner but you have repaired it so beautifully and I have worn it every day since its return. " " I just wanted to say I received my jumper back safely on Saturday and it looks fantastic! Your team have done a fantastic job, thank you so much. Beautifully packaged too and such a quick turnaround. Really impressive." " I know you were concerned about the jumper, however I've got to say the jumper is in the best condition I've ever had it in. It's like new. The hole repair is fabulous. Please pass on my thanks. " " Just received my jumper back from you. What a fantastic job, thank you very much. " " Thank you so much for your fabulous service and very reasonably price repair service. I will have no hesitation in recommending you! My cardigan now looks amazing! " " I just want to thank you for your most incredible service. I've never experienced anything like it. I have told and will continue to tell everyone. Everyone! " " I like the little heart-shaped cedar blocks. They are lovely. All of the cashmere items have come back looking like new with all pilling and bobbles disappeared. I will use Love Cashmere redressing Service again. " " What a wonderful job you have made of my jumper. It looks as good as new. Thank you so much. " " My jumper arrived today, another excellent job. Thank you! " " I just wanted to say thank you for the amazing work you have done on my jumpers! " " Invisible repair, quick turn around time, and a hassle free transaction. Very satisfied customer! " " I just wanted to say I couldn't be happier with my cashmere jumpsuit! You are cashmere angels! " " I have just received my jumper back and I had to contact you to say how pleased I am with the repair, which is invisible. The service and turn around time was excellent. " " Many thanks for offering this great service - I will definately be using you again. " " Great service - my cardi is like new again! " " I just wanted to let you know how happy I was with the speedy turn around, quality of the work, and your customer service! Thank you! " " My cashmere jumper is like new again. Thank you. " " Having purchased my cardigan at the sales, I did debate whether the premium cost of re-dressing could be justified - however, I'm delighted with the result. Invisible repair, all pilling removed and a soft fresh garment ready to wear just like new. Thank you! " " Just a quick word to say that I was hugely impressed with your service. Jumpers came back flawless and beautifully cleaned. It was like a whole new wardrobe. " " Thanks so much for a wonderful service. I've been recommending you already. " " I'm delighted with my cashmere cardigan - like new! And great packaging. " " We received a jumper back from you on Friday and cannot tell you how grateful we are for your brilliant service. Your magic fairies have restored it - thank you! " " I can't thank you enough for the repair and also the superb customer service. I shall not hesitate to recommend you to my friends! " " I had to let you know how happy I am with the repair carried out on my cashmere garment. I think you've done a fabulous job, it's like brand new again. Thank you. " " Thank you so much for repairing my favourite jumper! Fantastic... "
" I heard about your service from a friend so I thought I'd give you a go... one of the best decisions I've ever made! Thank you for saving my beloved cashmere cardigan! To anyone who is thinking about using this service - go for it, you will not be disappointed! " " Your redressing service is amazing!! I didn't know cashmere could feel this soft and luxurious! I'll be sending the rest of my jumpers so that they can all feel this good! Thanks a lot! " " One happy customer... "
" Please pass on my thanks to all at Love Cashmere - you've saved my favourite cashmere cardigan. Thanks so much! " " Thank you very much for your professional service - I'm sending the rest of my cashmere to you today." " I've just received my 5 jumpers back and I just wanted to let you know how pleased I am! They really are as good as new and they look wonderful. I'm going to be sending some more immediately, this is a great service! " " I just received my jumper back and I'm very happy indeed with your service! The jumper looks excellent! I will be recommending you to others. " " I wish I'd found you years ago! I shall definitely be using your service again and recommending you to family and friends. " " I just got my 5 cashmere items back. They look and feel like new. I'm delighted and will definitely use your service again. I'm so glad I found you! " " I just received my cashmere sweater back today and I wanted to thank you for such a beautiful job! " " I received my jumper back today and it is beautiful. I cannot thank you enough. " " Thank you so much for restoring my favourite cashmere sweater - I will be sending you more very soon! " " What a fantastic service! I'll definitely be recommending you to my friends and family. Thanks so much! " " Absolutely thrilled thank you fantastic job! " " My compliments go to the team at Love Cashmere, you have done an astounding job! Thank you very much. " " Thanks very much for your fabulous service again. " " A big thank you. I will definitely use your excellent and very efficient service again in the future. " " It is absolutely fantastic and I am so grateful that my favourite jumper gets to live on! " " A HUGE thankyou. We are delighted! Another is on it's way! " " I just received my travel-wrap back, and now I understand why you are called LOVE cashmere - I really, really LOVE your company, for it is repaired so beautifully! Can't even find where the small hole was! Thank you so much for your great service! " " What a fantastic service! Thanks so much! " " Thanks ever so much for such a quick and professional job. Will look out more of my cashmere sweaters for further treatment. " " Thankyou very much it's been a pleasure to do business with you, very swift and efficient. I'm very impressed with your service. " " Many thanks for the splendid job of repairing my cashmere sweater. It was a good job well done, great service. I will be spreading the word. One very satisfied customer. " " Item received today – wow! What a job. Well done. " " I'm glad to be able to say that the service was efficient and excellent. " " I am thrilled! Thank you so much!! I will definitely recommend you! " " Thank you so much - I am very impressed - they look like new again and I can't even see where the small hole was in the front of the grey sweater! A wonderful service. " " I was delighted how quickly it was returned. I will be sending you another garment soon. " " Many thanks for the remarkable repair to my jumper. I cannot see where the damage was. A superb piece of work! " " We have just used your service for the second time and am impressed with the quality of the work, the value for money and the efficiency of the service. " " I can't even tell where the hole was, you saved my favourite cardigan! Thanks : ) "
" I'm thrilled, my favourite sweater is like new again. Thank you! " " I was delighted with the service in fact I have recommended it to my sister. " " My cardigan was safely returned, beautifully wrapped and de-pilled. I can now wear it again so I am very pleased. " " Items arrived and look great. Thanks "
" I am really delighted by the expertise and customer service I have received from 'Love Cashmere'. Having seen how beautifully my sweater has been treated I am now kicking myself for throwing out other cashmere garments that I had thought were past it... "
" Thank you so very much for looking after me and my cashmere so beautifully. " " I have received my garments back in wonderful condition. I did use another company before who no longer deal with cashmere so I will use you again and recommend to my friends who I know will also be interested! " " Thanks for offering such a great service! " " I got my sweater back today. It looks as good as new and the repair is invisible. I am very happy with the service and I will definitely come back again and recommend you to my friends. " " I am absolutely delighted with my garment! It feels so much softer than when I wash it and the tiny hole has been repaired invisibly. I am truly delighted and have already telephoned my Mum-in-law to recommend you to her as she, like me, loves cashmere... "
" I received the garments and they were mended beautifully. Many thanks for your help! I shall definitely be recommending you to my friends."